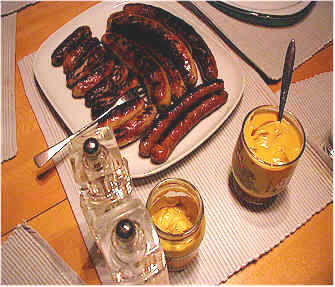 I arrived in Deutschland around mid-day, greeting by the official Welcoming Committee, Norbert Auth and Matthias Wooge. 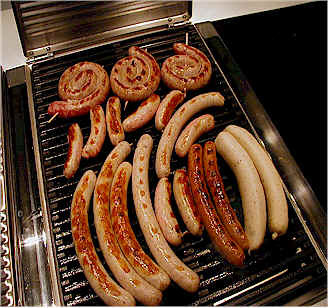 They were waiting for me at Frankfurt's humungous airport. We immediately drove to the Rheingau region, some 15 minutes west of the airport. 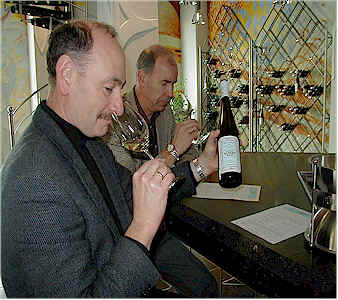 We stopped at the famous Rheingau estate of Robert Weil. They actually maintain a Napa Valley-styled wine-tasting room. If the building looks familiar and you've only visited wineries in Napa, keep in mind Beringer's tasting room is in a place they call the "Rhine House." Norbert (left) and Matthias "go to work" immediately! Two Fans of Robert Weil! We then took a look in the cellars of Weil. There's a tank of a favorite wine! 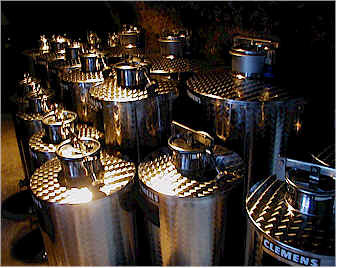 You'll find many incredibly small tanks in German wineries, as they often make tiny quantities of certain, special wines. 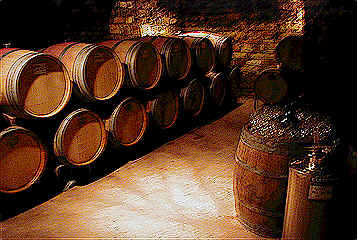 The barriques are used for Weil's red wine. 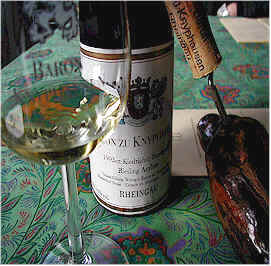 We then stopped at Weingut Freiherr Zu Knyphausen in Erbach. This is a lovely 22 hectare property that's been around since 1727. 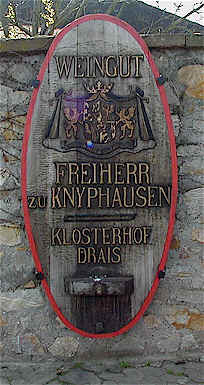 Gerko Freiherr zu Knyphausen poured us a number of very good wines. 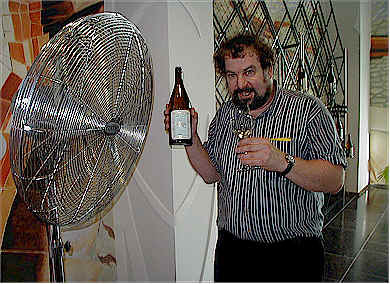 Amusing is his "little" everyday wine called "Der Knippie". 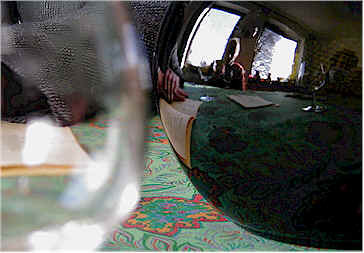 We tasted a nice range of wines. 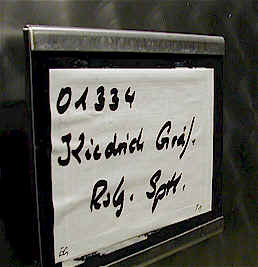 Especially fine was his 1993 Kiedricher Sandgrub Auslese, a mature wine with great, long honeyed flavors. We then visited the Weingut Peter Jacob Khn in Oestrich, a relatively unknown town outside the Rheingau. This family-operated property comprises some 15 hectares. 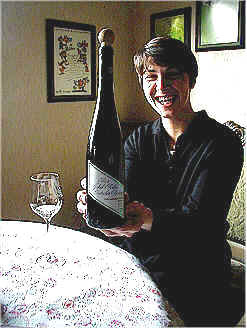 Young Frulein Khn shows off one of their "Doosies," an Oestricher Doosberg Riesling. Miss Khn was a "Wine Queen" in a local wine fair. I had not met royalty until then! Though Matthias has engineered many important projects at his firm, Hochtief, none is more important than Ike. And she is a project! She now studies in Nrnberg. We drank what turned out to be the best Cappuccino on my European visit and I gave the Wooge's a bottle of Turley's famous "Zindelfinger." 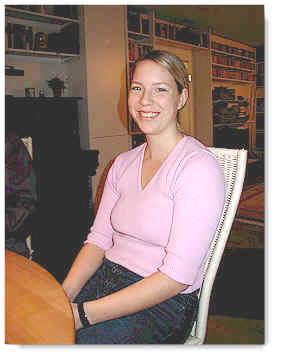 Even Mrs. Matthias, Gunhilde (pictured here without a cigarette for the first time), seemed excited about this rarity. 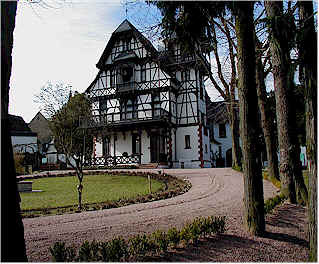 We then made tracks for Schloss Auth in Rodgau, where Norbert's wife Gaby was busy with dinner preparations. 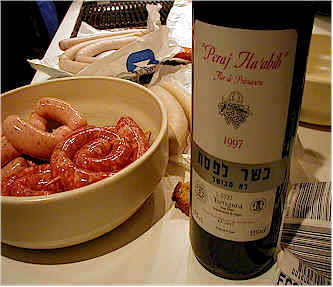 We had some sausages from the local sausage-meister and some Spanish red. Gaby and Famous Eva Block put together a nice dessert!